This battery-powered hedge trimmer is lightweight, saves on fuel costs with low noise and zero emissions. 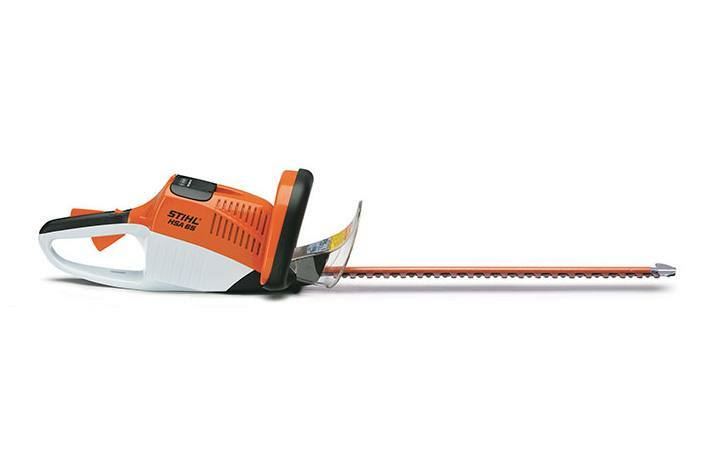 The STIHL HSA 65 Lithium-Ion Hedge Trimmer features a 36-volt lithium-ion battery for strong, quiet cutting performance. There’s no gradual drop in power – it runs at full power until it is ready for recharge. The HSA 65 uses no gasoline, meaning there’s no fuel cost, no exhaust emissions and no restrictive power cords. That adds up to a winning combination for trimming professionals. In addition to the fuel savings, the STIHL HSA 65 is four times quieter than its gasoline-powered equivalent, while remaining strong enough for professional use. With its high cutting speed, the HSA 65 allows professionals to complete more trimming in a short amount of time. Its tooth spacing and diamond-ground blade edges result in cleaner cuts, even through thick and tough shrubbery. The hedge trimmer’s 20” blade length is an efficient working length for most applications and its included tip protector helps prevent blades from being dulled or damaged. And because it’s so lightweight, the HSA 65 lithium-ion hedge trimmer is ideal for both controlled sculpting and general hedge trimming tasks. Run time on a single battery charge can vary based on battery type, charge level, tool model, operating conditions, user operating style and remaining battery capacity. HSA 65 hedge trimmer, battery and charger are all sold separately.